This page is largely based on a profile compiled and published in early 2007 by Right Web as "Profile: Jeane Kirkpatrick (1926-2006)", RightWeb, December 12, 2006. 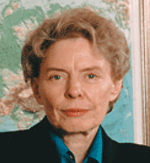 Jeane J. Kirkpatrick, who was the first woman to serve as U.S. Ambassador to the United Nations (1981-1985), and an important intellectual leader of the neoconservative political faction, died on December 7, 2006, aged 80. Kirkpatrick was the Thomas and Dorothy Leavey University Professor at Georgetown University between 1967 and 1978, when she left to join the American Enterprise Institute. Kirkpatrick was a fierce anti-communist whose writings on dictatorships for Commentary magazine in the late 1970s caught the eye of Ronald Reagan, prompting him to nominate her to the UN ambassador post. Kirkpatrick went on to become a proponent of the post-Cold War neoconservative agenda, which emerged in the 1990s and helped shape the preemptive and antiterror foreign policies of the George W. Bush administration. Upon Kirkpatrick's death, the Wall Street Journal editorial page—a key outlet for neoconservative opinion—opined in an obituary that Kirkpatrick's ability to "use words as weapons" made her a particularly effective diplomat and political operative. Comparing Kirkpatrick to another erstwhile neoconservative-aligned ambassador to the United Nations, John Bolton, the Wall Street Journal argued that Kirkpatrick's "no-nonsense bluntness" in defending U.S. interests at the UN Security Council made Bolton "sound like Little Bo-Peep." The Journal also highlighted Kirkpatrick's role, together with a number of other high-profile neoconservatives and like-minded anti-communists, in forming the second incarnation of the Committee on the Present Danger (CPD) in the late 1970s, quoting her rationale for creating the CPD, an oft-heard neoconservative refrain: "We were concerned about the weakening of Western will". In a laudatory article written a few months before her death, the right-wing Washington Times highlighted Kirkpatrick's conversion from Democrat to Republican, which took place after she took up the post of UN ambassador under President Reagan. The newspaper pointed to Kirkpatrick's famous phrase, coined during the 1984 Republican National Convention: "blame America first," which would become a hallmark of anti-liberal rhetoric. Repeating the by then familiar neoconservative argument that the Democrats had abandoned the vigorous anti-communism of Harry Truman and Sen. Henry “Scoop” Jackson, Kirkpatrick said: "When Marxist dictators shoot their way into power in Central America, the San Francisco Democrats don't blame the guerrillas and their Soviet allies. They blame United States policies of 100 years ago. But then they always blame America first". A Los Angeles Times editorial took a different tack in its assessment of Kirkpatrick's career, choosing to highlight her highly controversial thesis that right-wing "authoritarian" governments are more amenable to democratic reform than left-wing "totalitarian" states. The argument, first laid out in Kirkpatrick's seminal 1979 Commentary magazine article, "Dictatorships and Double Standards", won the attention of several important political figures, including then-presidential candidate Reagan, which led to her nomination as UN ambassador, a post she served from 1981 to 1985. Though it had great influence, Kirkpatrick's argument, which among other things provided a convenient justification for allowing alliances with brutal right-wing dictatorships as part of the U.S. anti-communist crusade in places like Central America, has ultimately proved to be "dead wrong," according to the Los Angeles Times. Pointing to the democratization of numerous post-Soviet states, the Times argued: "Like other reductionist theories, the Kirkpatrick doctrine ran up against the wisdom of H.L. Mencken's observation that ‘for every problem, there is a solution that is simple, clean, and wrong'". Part of Kirkpatrick's motive for writing “Dictatorships and Double Standards” was to question the legitimacy of both the human rights and democracy agenda promoted by then-President Jimmy Carter. She argued that his policies were destabilizing friendly authoritarian regimes—including those of the Shah of Iran and Nicaragua's Anastasio Somoza. Kirkpatrick also insisted that instead of pushing these regimes to reform, the United States should provide them support as allies in the struggle against Soviet communism. Moscow, she argued, was the greater evil, and that in any case "authoritarian" regimes could one day become "democracies," whereas communist "totalitarian" regimes could not. The Carter administration, she argued, focused on governments that "turn out to be mainly those in which non-communist autocracies are under pressure from revolutionary guerrillas … [On the other hand] we seem to accept the status quo in communist nations (in the name of ‘diversity' and national autonomy) but not in nations ruled by ‘right-wing' dictators or white oligarchies." In his book The Rise of the Vulcans, James Mann comments that while Kirkpatrick could have argued that the way out of this double standard was for Carter to press for democracy in all nations, not just non-communist autocracies, "In practice, Kirkpatrick's article suggested precisely the opposite solution: that the United States should end this double standard by becoming more tolerant of the status quo in dictatorships that support American policy". Further, according to Mann, Kirkpatrick's thesis "created underlying tensions" in the neoconservative movement, between those like Paul Wolfowitz who seemed committed to the moral imperative of promoting democracies, and those who, following a means-justify-the-ends logic, were willing to support friendly dictatorships to defeat communism. "[In the 1980s] the neoconservatives struggled to come to grips with the antidemocratic implications of Kirkpatrick's article, sometimes defending it, sometimes ignoring it," Mann wrote. By the start of the new millennium, neoconservatives "had come to espouse ideas directly contrary to those in the article … Kirkpatrick had suggested that democratizing third world countries might take decades or centuries, but by 2002 neoconservatives were seeking democratic change among the Palestinians and in Iraq within no more than a couple years". To some degree, Kirkpatrick's views on democracy echoed those of neoconservative progenitor Irving Kristol, who during the early stages of the Vietnam War wrote that the "plain truth is that South Vietnam, like South Korea, is barely capable of decent self-government under the best of conditions. It lacks the political traditions, the educated classes, the civic spirit that makes self-government workable … No amount of American aid, no amount of exhortation, no amount of good advice can change this basic condition … The most we can hope for in South Vietnam is what we have achieved in South Korea; that is, to remove this little, backward nation from the front line of the Cold War so that it can stew quietly in its own political juice." (Kirkpatrick's late husband Evron Kirkpatrick was a long-time collaborator of Irving Kristol). But as Mann points out, despite the equivocal stance on democracy that key neoconservatives had taken during the decades leading up to the end of the Cold War, by the early 1990s it had become the cornerstone of a new neoconservative agenda. Vigorously promoted by the likes of Joshua Muravchik (a former member of the Young People's Socialist League and a scholar at the American Enterprise Institute (AEI)), democracy quickly replaced anti-communism as a key rationale for an aggressive, interventionist U.S. foreign policy for the post-Cold War era. Kirkpatrick repeatedly associated herself with this new campaign, although with caveats. At the time of her death, Kirkpatrick was a fellow at the AEI, where she wrote on human rights, UN reform, and international law. She also used this perch to actively promote policies pushed by the Project for the New American Century (PNAC), a letterhead group based in the same office building as AEI and headed by several neoconservative ideologues, including Irving Kristol's son William Kristol. PNAC played a singular role in championing the invasion of Iraq in response to the 9/11 attacks, arguing in an open letter to President Bush shortly after the attacks that the country should invade "even if evidence does not link Iraq directly to the attack." Kirkpatrick signed her name to this letter, along with a stable of high-profile neoconservatives and/or hardliners, such as Frank Gaffney, Charles Krauthammer, Richard Perle, and Marshall Wittmann. Shortly after this letter was published, Kirkpatrick wrote an article for the Chronicle of Higher Education in which she expanded on her reasons for why the United States should go to war in response to 9/11. She wrote: "It would be a very serious mistake for the United States not to respond with force. I do not usually ever advocate the use of force to solve problems. I just think that this is a major challenge, and that we're forced to, in order to protect our civilization. And I mean our civilization. I don't just mean American civilization, I mean modern civilization. What they are targeting is modern civilization". In an interview a few months before her death, Kirkpatrick seemed to backtrack on her initial enthusiasm for the Bush administration's interventionist war on terror and contradicted the sentiments of many neocon ideologues, like Max Boot of the Los Angles Times and the Washington Post's Charles Krauthammer, both of whom have argued that the United States should embrace an imperialist mission. Saying that Bush's foreign policies are "a little too interventionist for my taste, frankly," Kirkpatrick said that the country did not "have an obligation to engage in a new imperialism" and that she was "skeptical of nation-building. It is extremely difficult for one nation to seriously remake another nation." However, she also added, "I am very much in favor of [Bush's] actions in Afghanistan and have not opposed them in Iraq". Kirkpatrick also actively worked with a number of groups (several that emerged in the wake of 9/11) that have advocated the democracy thesis as an important rationale for an expansive war on terror, including the Foundation for the Defense of Democracies, a group run by former New York Times writer Clifford May that claims to be the "only nonpartisan policy institute dedicated exclusively to promoting pluralism, defending democratic values, and fighting the ideologies that drive terrorism." Kirkpatrick also served in varying capacities for such neoconservative-driven groups as Freedom House, the Jewish Institute for National Security Affairs, the Ethics and Public Policy Center, and Empower America. Earlier, in the 1970s and 80s, Kirkpatrick was associated with the Coalition for a Democratic Majority, Midge Decter's Committee for the Free World, and the fanatical Cuban American National Fund, which was founded by anti-Castro Cuban émigré Jorge Mas Canosa. Washington Institute for Near East Policy (board member). Leader and Vanguard in Mass Society: A Study of Peronist Argentina, MIT Press, 1971. ↑ "Jeane Kirkpatrick, Ex-Ambassador, Dies", Associated Press, December 8, 2006. ↑ Georgetown University Office of Communications, "Georgetown Remembers Jeane Kirkpatrick", University News, December 8, 2006. ↑ "Jeane Kirkpatrick," Wall Street Journal obituary, December 11, 2006. ↑ Ralph Hallow, “Kirkpatrick Hit Liberals for Blaming America First,” Washington Times, May 15, 2006. ↑ "Dictators Right and Left", Los Angeles Times, December 11, 2006. ↑ Jeane Kirkpatrick, "Dictatorships and Double Standards" (Pdf) Commentary, November 1979. ↑ James Mann, Rise of the Vulcans, Viking, New York, 2004, p.92. ↑ James Mann, Rise of the Vulcans, Viking, New York, 2004, p.93. ↑ Mark Gerson, The Neoconservative Vision, Lanham, Maryland: Madison Books, 1997, p.113. ↑ Project for a New American Century, "Letter to The Hon. George W. Bush", September 20, 2001. ↑ Jeane Kirkpatrick, "The Case for Force", Chronicle of Higher Education, September 28, 2001. ↑ Ralph Hallow, "Kirkpatrick Hit Liberals for Blaming America First", Washington Times, May 15, 2006. Foundation for the Defense of Democracies, "Board of Directors Biographies, undated, accessed May 2007. Jewish Institute for National Security Affairs, "Board of Advisers", December 30, 2005. (Page now only found in the Internet Archive). American Enterprise Institute, "Jeane Kirkpatrick: Senior Fellow, March 15, 2005. (Page now only found in the Internet Archive). American Enterprise Institute, "Jeane J. Kirkpatrick", March 15, 2005. (Page now only found in the Internet Archive). "Jeane Kirkpatrick, Ex-Ambassador, Dies," Associated Press/ABC News, December 8, 2006. Greg Grandin, "The Bloody "Realism" of Jeane Kirkpatrick: Mid-Wife of the Neocons", Counterpunch, December 9 / 10, 2006. Richard V. Allen, "Jeane Kirkpatrick and the Great Democratic Defection," New York Times, December 16, 2006. This page was last edited on 26 August 2012, at 08:15.